Obaby’s irresistibly cute B is for Bear bedding selection is the perfect addition to any tot’s first nursery, with an adorable design which can surround your little one with sweet dreams and fun throughout their earliest years. 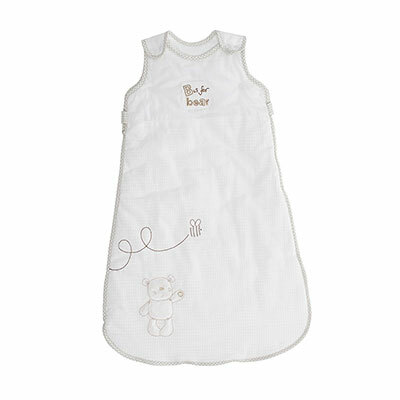 This cute and cosy B is for Bear sleeping bag, suitable for 6-18 months, feature an exquisite design, incorporating delicate and charming patchwork and appliqué techniques with a delightful soft to the touch B is for Bear motif. This stylish sleeping bag is comfortable and warm, ideal for active little ones that kick off their covers while sleeping, while a thoughtful zip opening allows easy access to save you disturbing baby. Available in a range of colours, these super snug sleeping bags look fantastic alongside Obaby’s B is for Bear furniture, while also having the ability to look great within a wide variety of other nursery settings and styles.